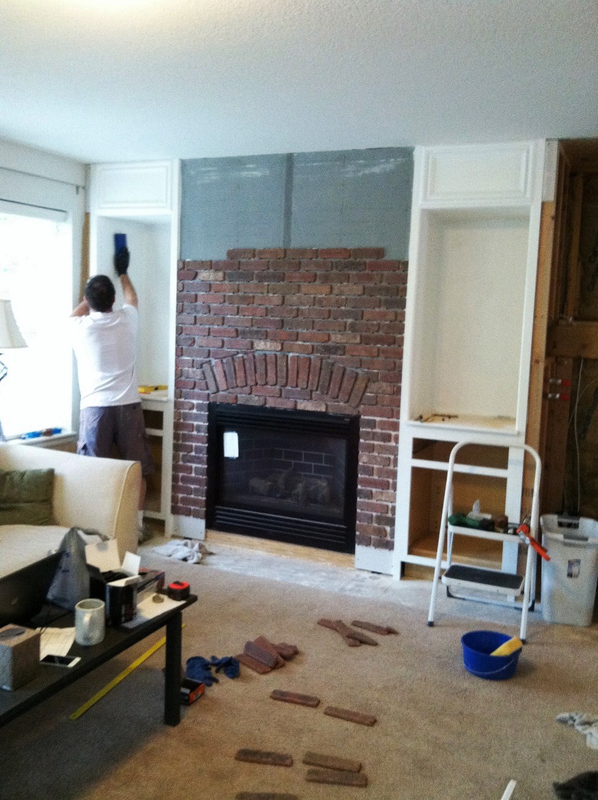 Today, I'm finally sharing a few photos of one of our renovation projects - the fireplace wall in our living room. After having lived with the mess and partially-finished projects since last winter, it's still sinking in that it's finally finished, and every time I walk into the room I feel a mixture of relief, awe and absolute contentment at how it's turned out. My husband and I bought this house, our first house, less than a year ago, and moved in just a week before Christmas. Here's the living room a few days after we moved in. Aside from the mess, you can see how different that wall was. 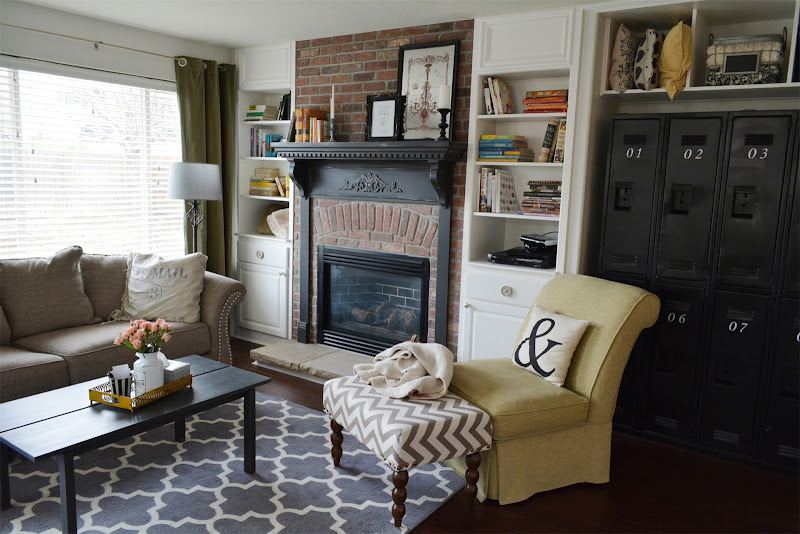 Beige tile around the fireplace. Useless dry-walled cubbies everywhere. I hated everything about that wall, but could see the potential. Before starting any major renovation projects, we spent our Christmas vacation, and the weeks following, painting the entire inside of the house. We covered up all those brown walls with a pretty, soft grey; in addition, we painted every door and every bit of yellowed, dirty trim with a coat of fresh white paint. With the painting done, I started sketching my vision for the fireplace wall. The drywall and cubbies would have to go. 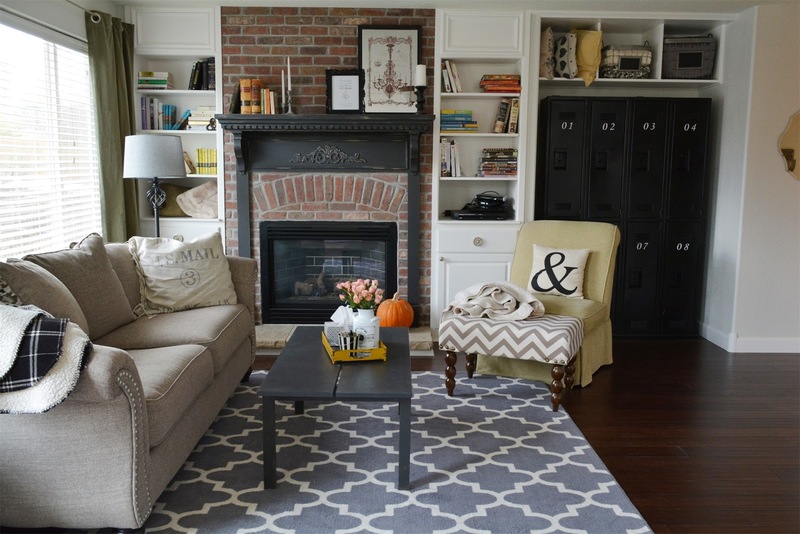 I dreamed of classic built-in bookshelves flanking the fireplace and a beautiful mantle. So one Saturday, we tore that wall down to the studs. That was one of the hardest work days I've ever experienced, and to be honest, it was scary making such a drastic change, not knowing if we'd be able to re-build the wall and make it look beautiful and professional. I initially thought we should move the gas fireplace to center it on the wall, and build large bookshelves on either side. But the hassle, and expense, of moving the gas line was too much, so we decided to leave it where it was. 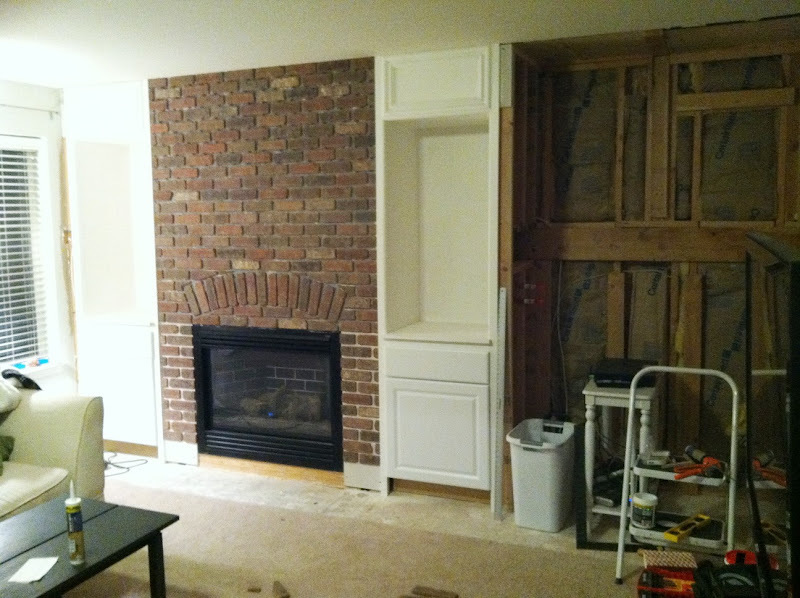 My husband re-built the frame around the fireplace for shelves and cabinets, and put up cement board as a backing for the brick. We used brick veneer, or "thin brick", and I'm proud to say that I put up every single one of those bricks myself. With the brick finished, and the shelves painted, it was all starting to come together. 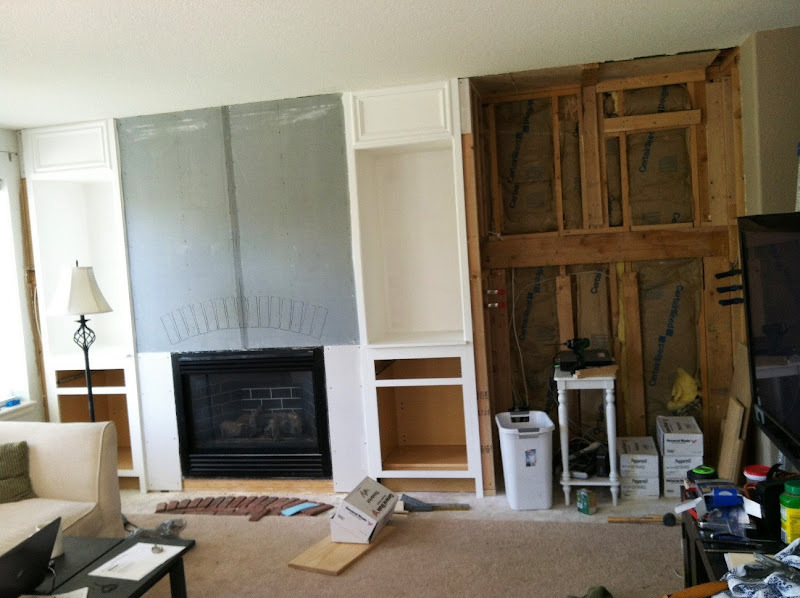 Since we didn't move the fireplace, we needed to figure out what to do with the empty space on the right, and there were a few possibilities for that space. A coat closet (but we already have one), an empty space for a bench, which would look lovely, or a little reading nook for a chair and ottoman. But when I found a set of old metal lockers on Craigslist for $80 in good condition, I knew they were too good to pass up. I sanded the rust off and spray painted them black. My husband built a wooden base for them, with felt pads underneath, so they could be moved around more easily - they're unbelievably heavy. The lockers are now filled with our DVDs, printer paper, and a few other things - they're perfect for storage. After finishing the drywall, texture and paint, my husband built the open shelves above the lockers, and they're just right for storing extra pillows and blankets. The last major project was the floor. 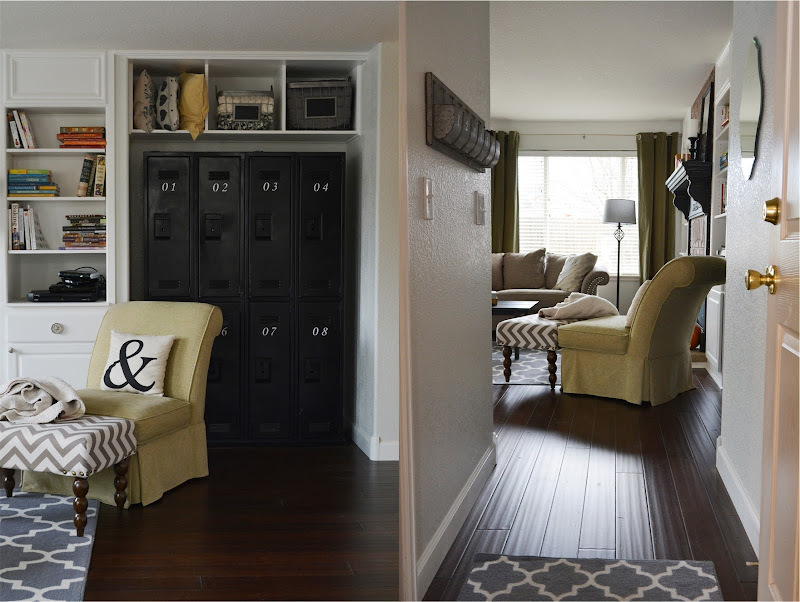 We knew we wanted to get rid of the shabby carpet and install hardwood, and we found an affordable option in bamboo in a medium/dark brown color we love; the color contrasts so beautifully with the light walls and white trim and adds so much warmth. After the floors, we installed freshly painted baseboards, and I fell in love with our house all over again. 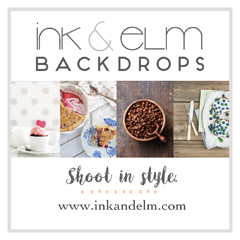 All the final details are just as important as the major projects. We mounted the TV (and speakers, too, against my will, but marriage is about compromise...) to the wall and ran the wires through the wall, under the floor (through the crawl space), and back up to the bookshelves where all the equipment sits. I still need to come up with a way to semi-conceal the electronics, but it's a small price to pay for clearing the floor of a bulky entertainment center. We decided it was time to choose new furniture together, since our old couch is pretty worn out, so we picked out a sofa and love seat in a pretty shade of oatmeal grey. It looks beautiful against the area rug. Everything else is from here and there, collected over time, and it all fell into place so beautifully. Now, you may think that I forgot to mention the mantle, but I was saving the best for last. Again, my husband took my sketch for a mantle design, and a compilation of photos, and built the mantle of my dreams. That crown molding, those corbels, the decorative accent in the center! It all takes my breath away. After he built it, I painted and distressed it a little, and then it was ready to be installed onto the brick. I cannot get over how much I love this feature. It's classic, elegant, and vintage, and I want to sigh with happiness every time I look at it. I'm also proud to say that we did not, at any point in all of this, hire help or contract the work out - we did it all ourselves. And I think we can appreciate the results so much more, knowing that our sweat and tears and aching muscles made all this happen. I had no idea when I married my husband that he was such an accomplished handymen, and I'm reminded every day of how fortunate I am to be with someone who works so hard to create a beautiful home for us. I'll leave you tonight with the last photo below, a view of the living room leading into the kitchen. As you can see, the new hardwood stops at the steps, but we hope to finish installing the hardwood on the rest of the main floor between Thanksgiving and Christmas. Also of note, is that this house only came with the step on the left. The railing extended all the way to the wall on the right, but I thought it would be so much more elegant and open to have steps on each side for a double entrance. So we cut down that portion of the railing, and my husband built the step on the right to match the one on the left. After the floor is done, we plan to get rid of the railing and do something else there as well - but I don't think I'll tell you what just yet. Beautiful ! God bless you both doing all the work yourselves. It shows you put a lot of care, love a thought and patience included. And I also love the steps from the kitchen to the living room, and that the kitchen is right next to the living room. Having the kitchen open to the living room was a big selling point for me - we hadn't anticipated the complications of the split levels, since I'm not a fan of the railings, but the double steps is definitely helping with that. You must be so proud.I love the LIGHT in your home..that is number 1 for me. I Everything is lovely..and I love the personal touches such as the mantel..the lockers..your wedding photo is perfect there..Kudos for all the hard work..you are a great team..if I may add humbly..Jacques and I always loved to do a lot ourselves also. Yes, the light! Having lived in apartments and a condo for all of my adult life, with no natural light in the kitchen, I just loved how bright and cheery this side of the house was when we decided to buy it. Doesn't it feel so much better to do the work yourself? I hope that these changes are good for the resale value, but after working so hard to make it what we want, it's hard to imagine ever wanting to sell it. I was a realtor for almost 30 yrs..every change you made=$ .. But I know what you are feeling.. I loved the clients that wanted a "home' ..more..there..I said it.